A few months back I saw this picture on my Facebook feed. I immediately thought that was a Wow! unit. Bonaparte’s sister Elisa was Grand Duchess of Tuscany and something-or-another of Lucca and Piombino (Princess I think). She authorised the raising of a bodyguard regiment from her Luccan and Piombonese subjects and given the uniform I am guessing she and her ladies-in-waiting had some hand in the design. I am not sure that the unit was ever raised in it’s entirety before she had to abdicate and retire to private life. But I knew that I wanted to try to paint it. However I did not want to buy any new figures so decided to do this unit as a ‘What If’. What if it were raised and Napoleon, with his need for manpower had called it to duty. To that end I decided to model this regiment on campaign. I have half a dozen boxes of Perry French plastic infantry and the spare Carabinier heads from the Perry Cuirassier/Carabinier box set. I needed some more heads and I got these from TMPer Virtualscratchbuilder who posted them to me from Denton, Texas. A couple of weeks later I have got them as finished as I ever get anything. 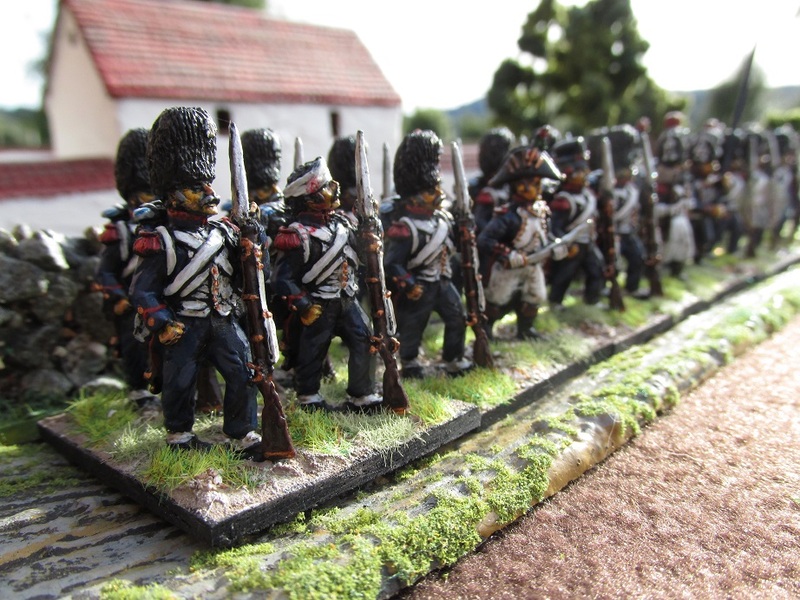 I have modelled them as a French Infantry Battalion with a Grenadier and Light Company. 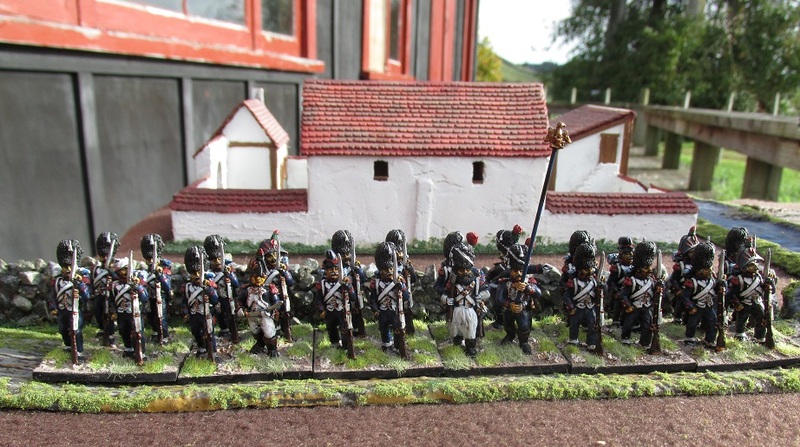 Also a couple of separately mounted voltigeurs and a custom casualty base for the unit. The flag was too complicated for me to bother with so I went with a simple tricolour in the colours of Lucca and Piombino. Oh yeah – and I gave them an Eagle – why not I say. There is also a solitary Victrix officer in there. 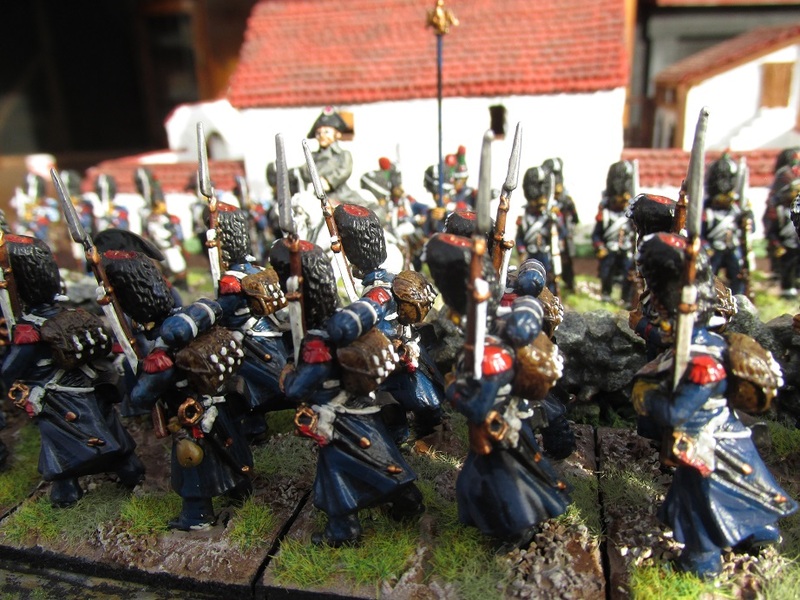 They will be joining some of the other fictional and almost fictional units in my Napoleonic armies in the cabinet. Hope you like them. I have been dreading painting these Highlanders ever since I brought the Victrix plastic sets off Trademe over a year ago. Probably more like two years ago. I think that the kilts were what was giving me conniptions. As it turns out it was not the kilts but the damned dicing on the bonnets. I just couldn’t get it right and after stuffing it up and repainting about four times I just left it as is. As long as they are identifiable from wargaming distance as Highlanders I am sure that people wont mind don’t care now. As far as the tartan goes I knew I could never paint as detailed as some that I have seen, so went with what I could to approximate the 42nd’s tartan. In the end I am pretty happy with how they turned out. The miniatures are Victrix with a smattering of Perry Miniatures parts (loading arms, a sergeant’s pike arm and a few other bits and bobs) and a single Westfalia Miniatures ‘Rude Highlander’. Will save the other one in the Westfalia set for the 79th. 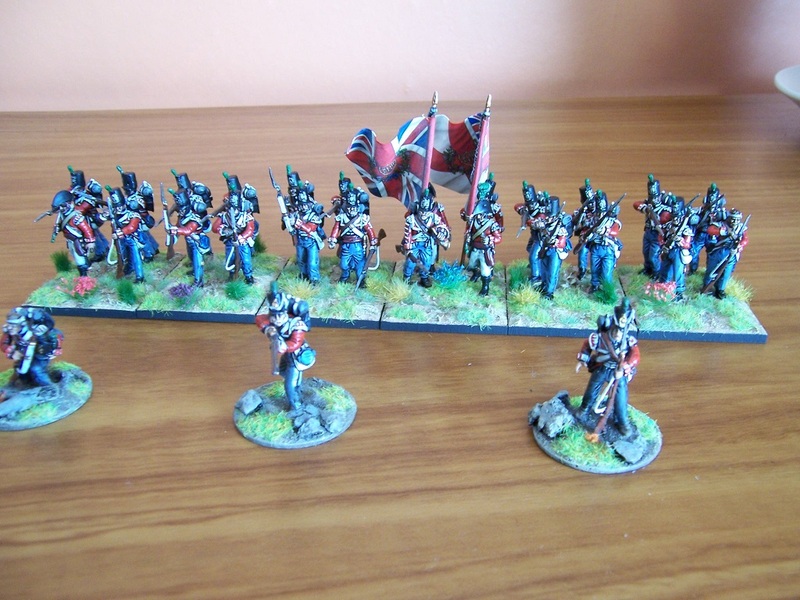 I have a matching casualty base from the Perry Miniatures British casualty set I painted a year or so back. The flag is the post-Peninsular one that comes in the Victrix Highlanders box. The Beunos Aries Battalion was constituted from Spanish prisoners taken during the British attacks on Spanish Argentina in 1806. These prisoners had been transported to Britain and were held in hulks in the Thames Estuary. When Spain became an ally they were shipped back to Spain, landing at Coruna, and due to a lack of Spanish kit were outfitted with standard British uniforms and equipment – hence their nickname, “Los Colorados”. They were attached to General Joaquin Blake’s Army of Galicia. At the Battle of Medina del Rioseco (July 14, 1808) they were taken in the flank and ridden down by French Cavalry and destroyed as a viable unit. 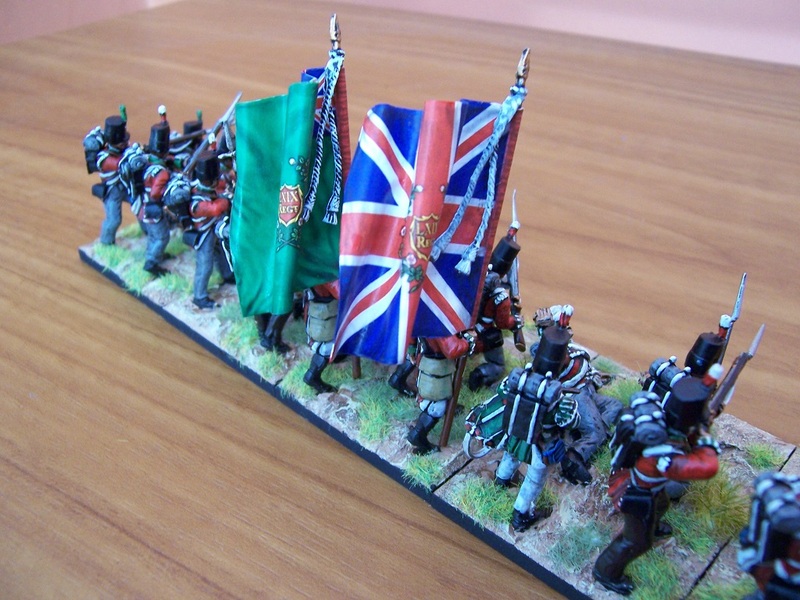 I would have liked to think that the Beunos Aries battalion managed at least one volley before they were destroyed so I have modeled them as a firing line – the only one so far in my Spanish army which is all currently March Attack infantry. As you can see the infantry are standard Perry Miniatures plastics (I know – I swore I would not do any more plastics) but the heads are all from Victrix. I prefer the Victrix heads to the Perry ones and I have hundreds of the buggers from a bulk buy of Victrix sprues I did a few years ago in an internet trade with a local wargamer. There is a solitary Victrix officer as well. I replaced the plastic flag poles with metal. I decided to do the plumes and cockades in Spanish red. I included a Grenadier company (why not) but the rest are fusileros. I have no idea of the flags this short-lived unit carried, if any, so gave them two ‘generic’ Spanish standards mostly because I think that they look cool with two flags. The flags themselves are old Captain Miniatures flags that they once gave away free off their website when they were still in existence. Basing is my standard Napoleonic mix – Selley’s Permafilla, some ballast for stones, painted in three shades of housepaint (light brown, some darker splodges and dry brush of an off white (actually it is the exact shade of GW Ubshanti Bone except comes in test pots that only cost $NZ4.00 for six times the volume of paint) and some flock and shrubbery added. 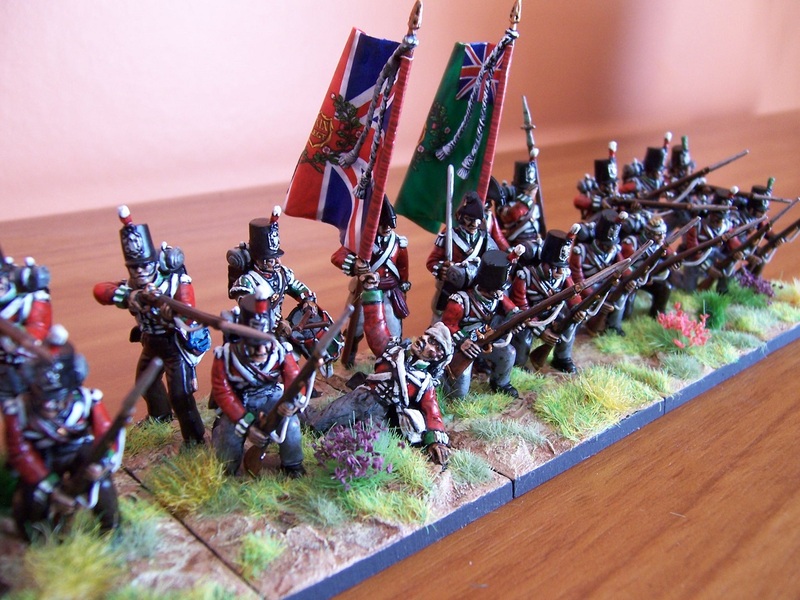 In doing this battalion I also had the notion of doing another command stand and a light company stand, I could use it as a militia battalion for Canada 1812-15 – red plumes not withstanding. WIP – What unit are these guys? 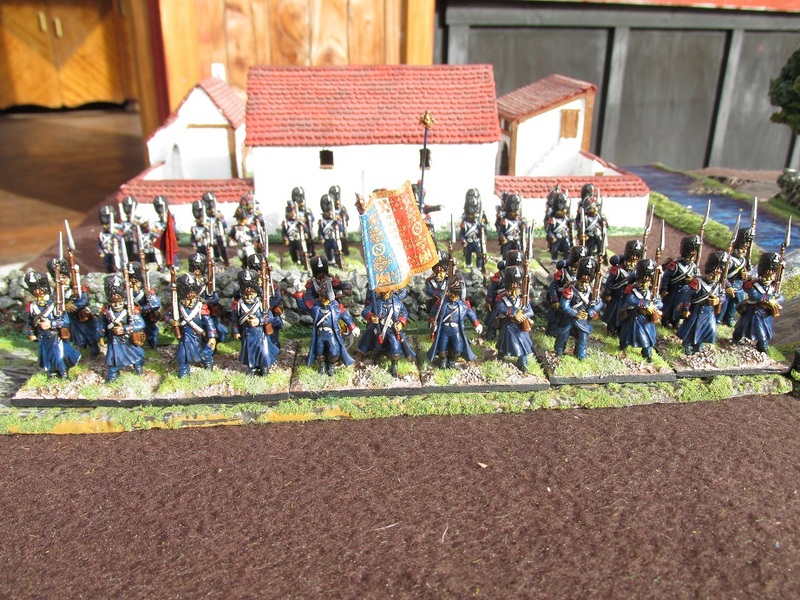 The second unit I finished this week was some artillery support for my budding Portuguese brigade. The gunners are all Elite Miniatures purchased from Elite Miniatures Australia. The guns are plastic Victrix British artillery. I picked the set up cheaply – mostly for the guns rather than the gunner figures. I am sure I will find a use for them at some stage though. 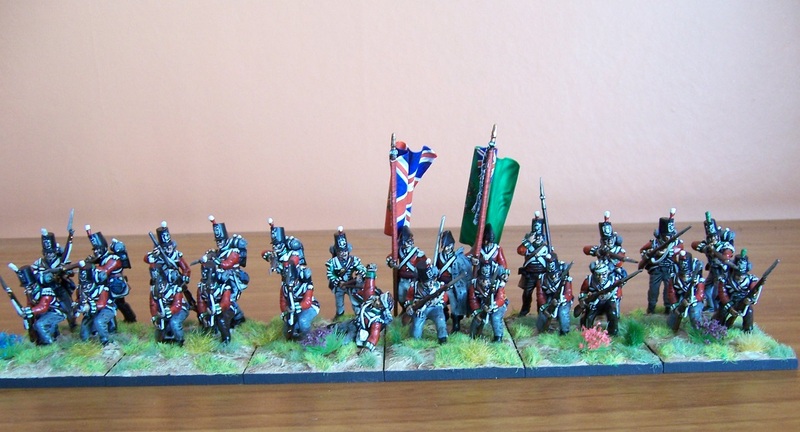 I think that this year’s NapCon will have a Peninsular War theme, so I want to get as many unit completed before hand as I can. 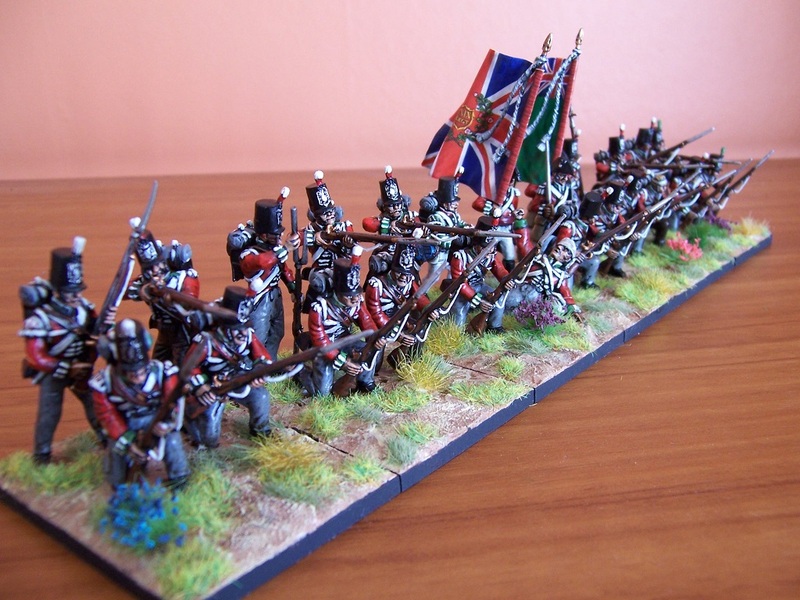 Still to do for my Allied forces – three regiments of Spanish Cavalry (Line, Dragoon and Hussar) and another British Light Dragoon regiment, several Spanish regiments and some other odds and sods stuff. 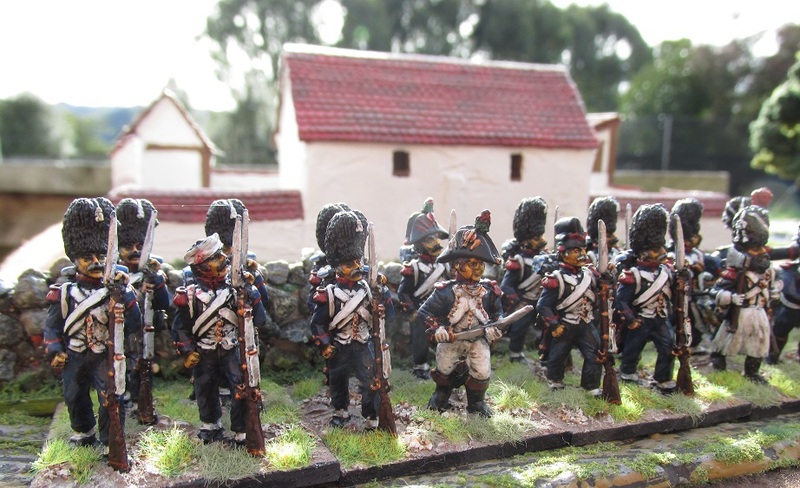 My army is themed around 1808-1811 so all my Portuguese are in the barrentina shako. 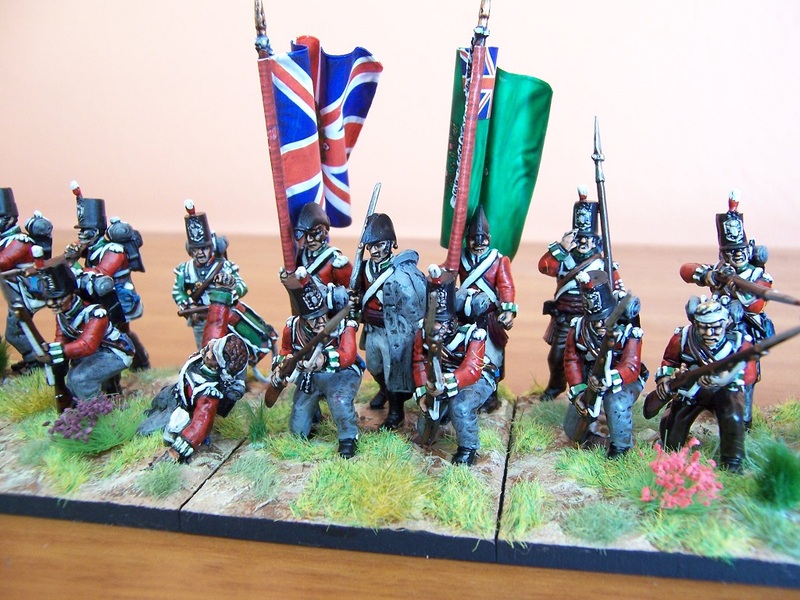 My first completed Napoleonic unit since January last year. I actually had these guys undercoated and the first dabs of colour on them at that time but fell into a depressive funk and they sat on the painting table until last week. 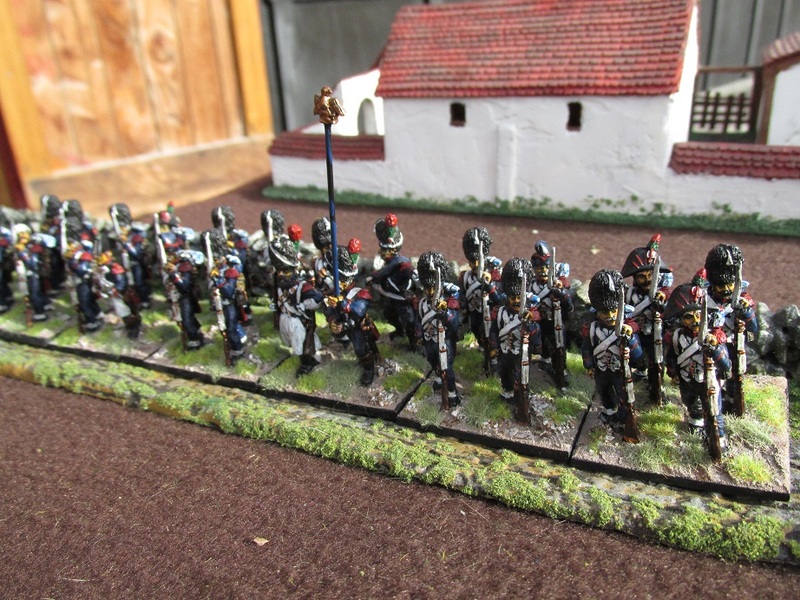 I actually feel as if I have my Napoleonic mojo back – a good thing as I have three regiments of British and Spanish Cavalry staring at me at the moment. 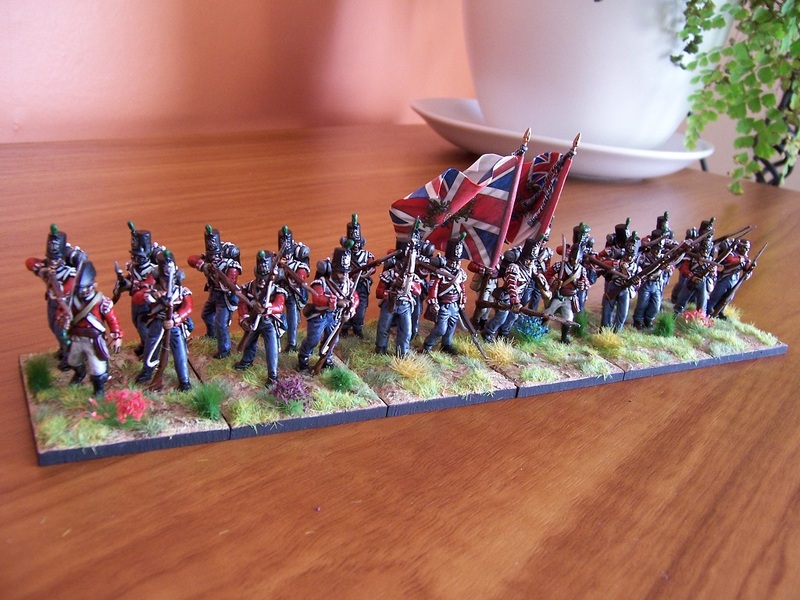 I painted these guys with no real reference material so was pleasantly to find that according to my copy of Military Dress of the Peninsular War there was indeed a regiment with white cuffs, blue collars and red piping. 2nd (Lagos) Infantry. 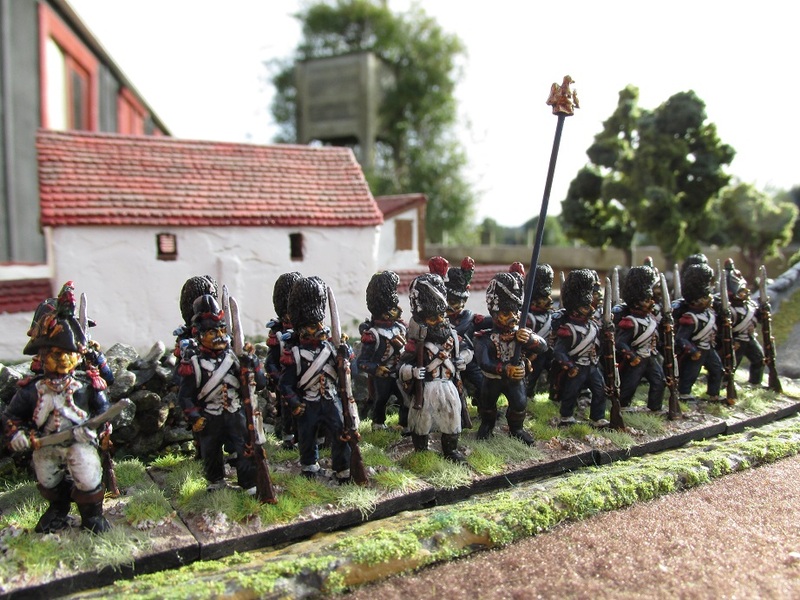 28mm Elite Miniatures models supplied by Nathan at Elite Miniatures Australia. Today’s update is two units I painted over a year ago and have finally got some better shots of. 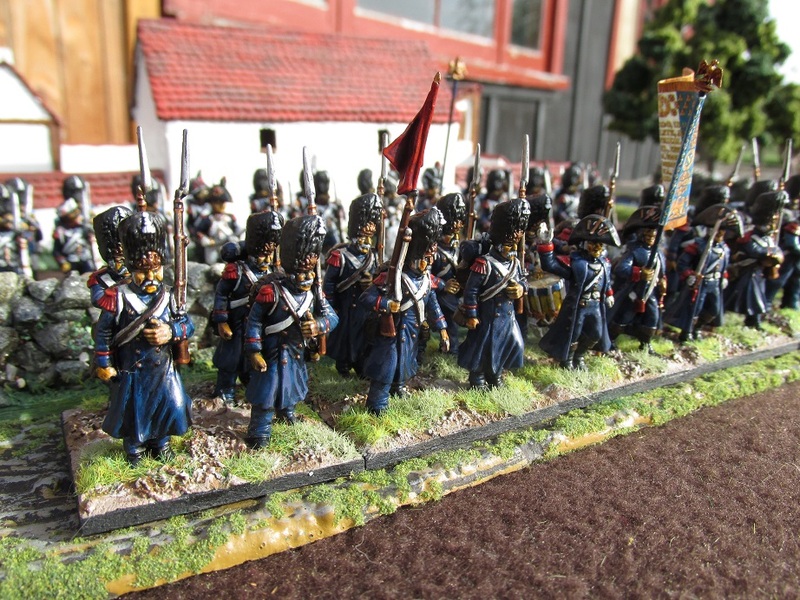 What French army is complete without battalions of Old Guard Infantry? None I say! 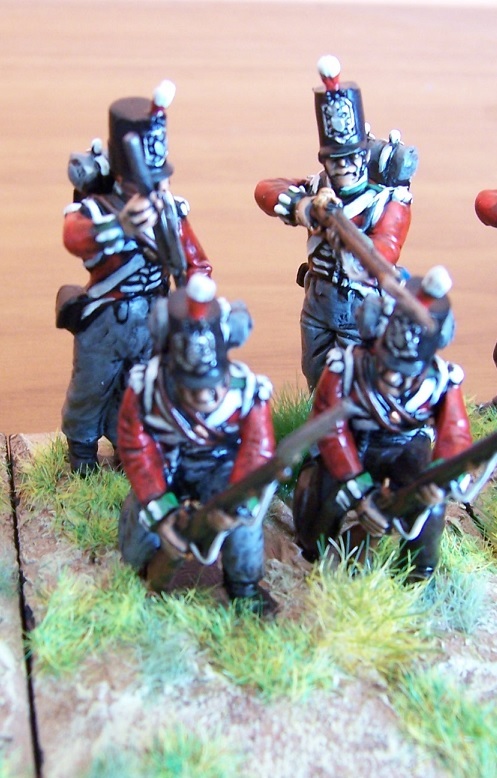 First off, a battalion of Victrix Old Guard Grenadiers. 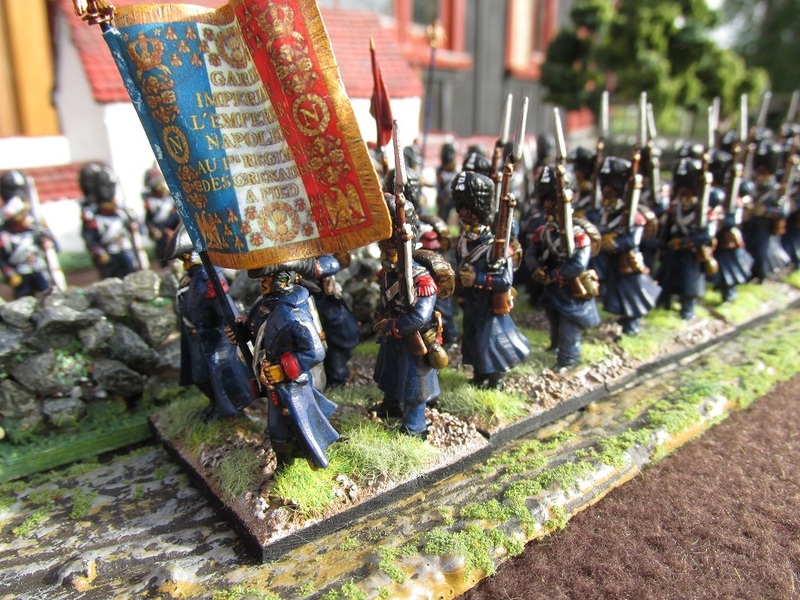 These are plastic and while superb miniatures, I fret more than Napoleon did about committing them battle. Secondly, a battalion of Chasseurs-a-Pied. These are excellent Front Rank miniatures and were, in my opinion, some of the better figures in the Front Rank catalogue before Alec started doing the recent Reinforcement Packs. 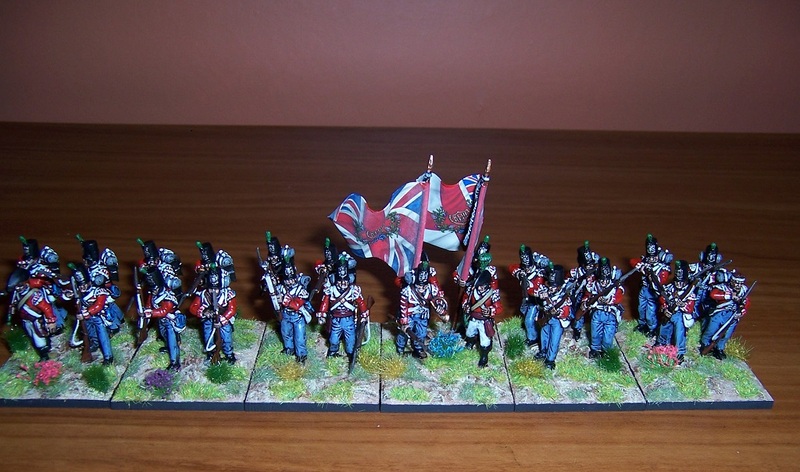 My latest battalion for the British Army of the Peninsular War. The 43rd (Monmouthshire) Light Infantry were part of the famous Light Division under General Crauford. 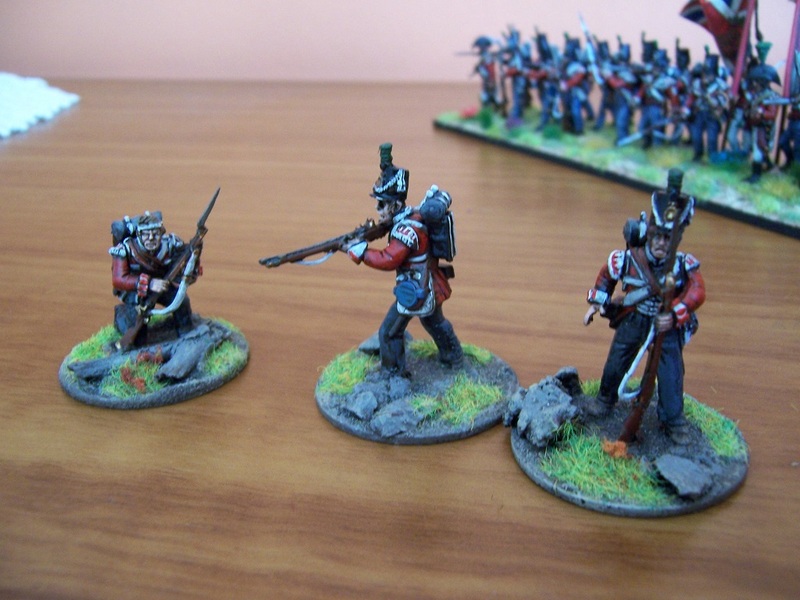 These are 28mm Victrix hard plastic multi-part miniatures. While I enjoyed the assembly and the actual painting, I have not enjoyed plastic figures as much as I thought I would. I have another two battalions on the go and once they are finished I won’t be going plastic again – unless I have absolutely no choice. I am pretty careful and I managed to break three bayonets that I just could not glue back on, necessitating the removal and replacement of whole muskets and arms. I have a crap load of these guys – like seven boxes, so I guess I will have spares for a long time. Anyway – on with the battalion. The flags are GMB – rushed to me in about a week from the UK to NZ. The eagle-eyed amongst you may spot a couple of Perry bodies and backpacks. 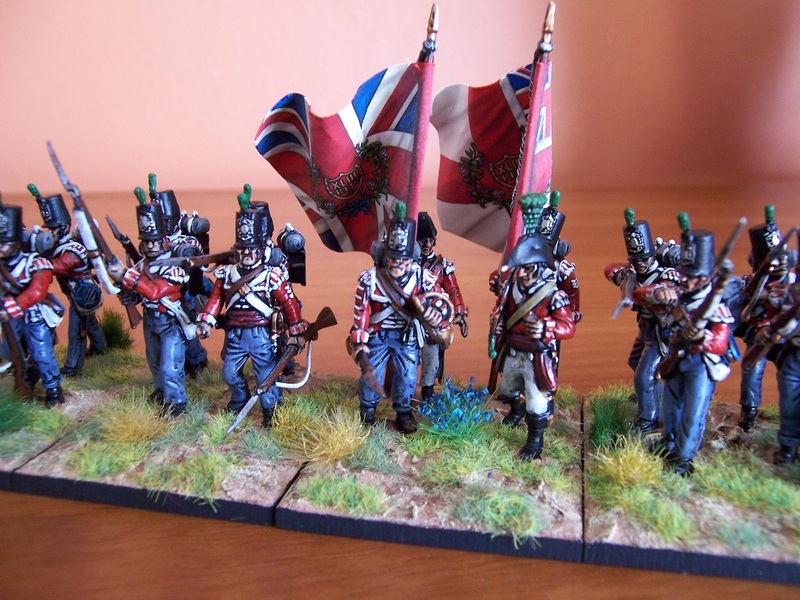 I just got the latest battalion finished for my British army. I am not sure the 69th Foot ever fought in the Peninsular campaign, but …well..what they heck. I had a flag for it. 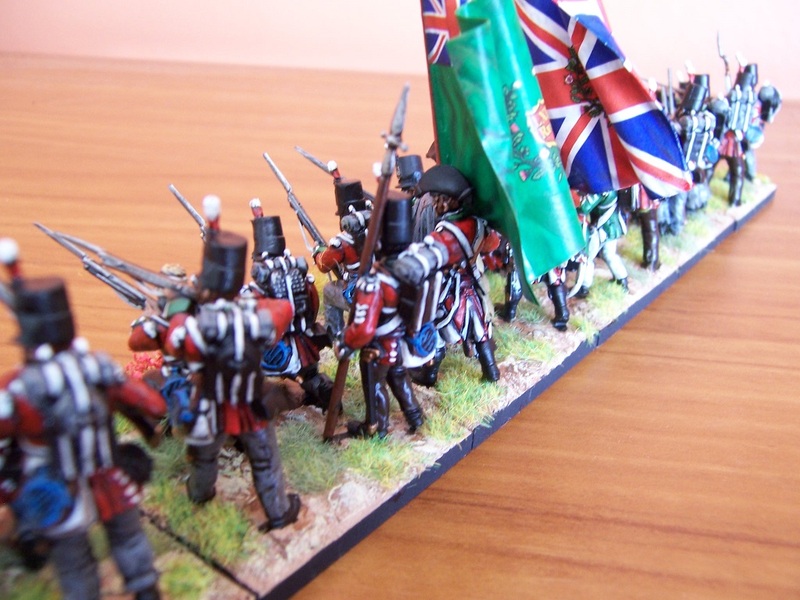 Figures are Victrix Peninsular British 28mm hard plastic. There are a couple of Perry British ‘arms’ in use in there for some variety. There is also a guest appearance by a Front Rank figure. 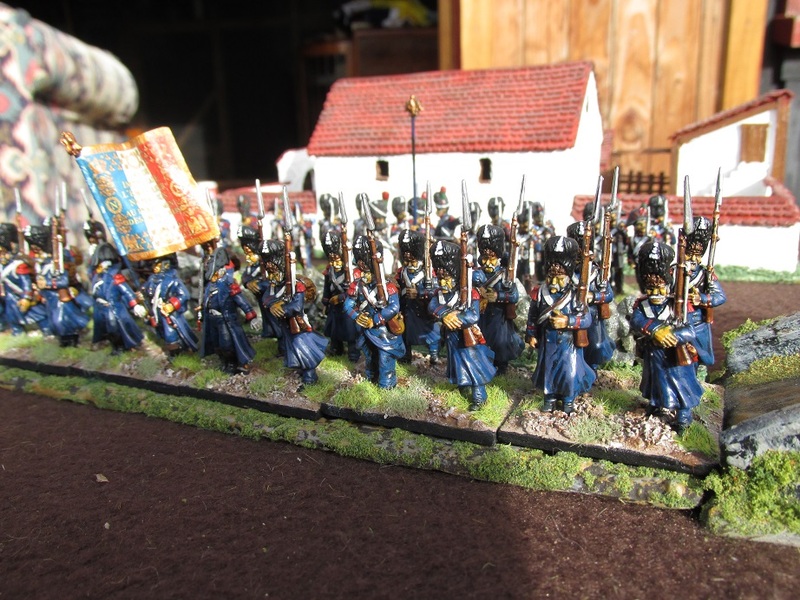 Once again I have used 40x50mm bases – mostly to give the plastic bayonets some protection from fat fingers, wargame terrain and so forth. 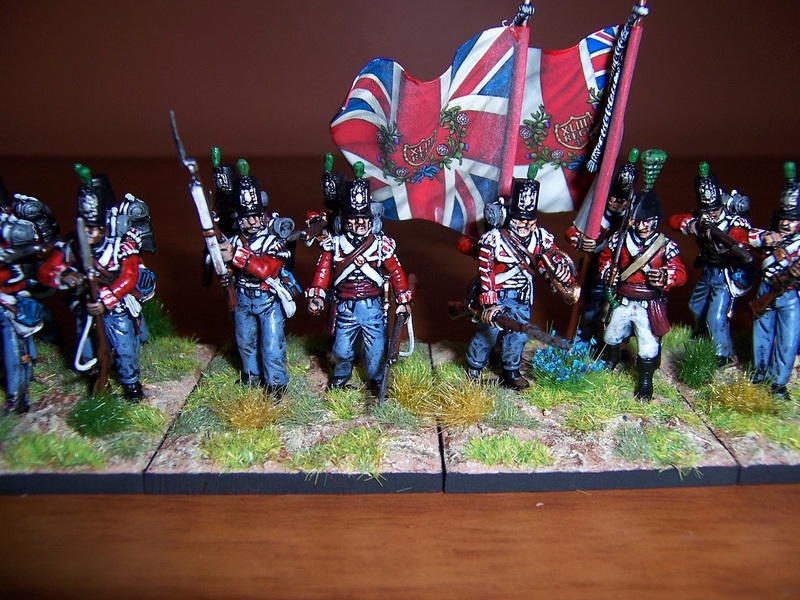 I used a French officer’s greatcoat from the Victrix French Napoleonic set to give the senior officer of this battalion something to wear. I quite liked the kneeling to receive cavalry pose that can be built from the British set so it was good that I recently acquired a lot of boxes of second hand Victrix sprues. The figure at the back of the next shot loading his musket has received a set of Perry British arms. These two manufacturer’s bits and pieces fit together perfectly. The shakos and packs are sized differently so I wouldn’t mix them in the same unit but using arms, heads and so forth presents no assembly problems.. The sergeant does not have molded stripes so they have to be painted on. 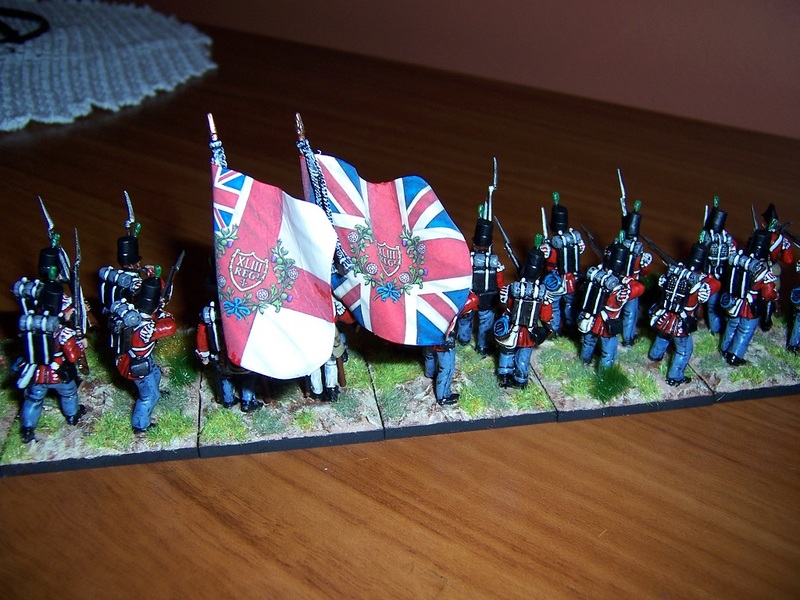 The flags are from Victrix – one of the sets that come with the boxes of infantry. Another view of the standards.